At my university, as I believe is now common at many institutions, the Art History program is embedded within the Art Department, so my colleagues are Studio Artists, Graphic Designers, and Art Therapists. I consider myself incredibly fortunate to work with colleagues who are enthusiastic about opportunities to collaborate, and so I have tried to take full advantage of the talents and resources that surround me. Several weeks ago, a painting professor helped my classes make and work with egg tempera. Over the summer, my class took a tour of the printing presses with that area’s faculty member. In Art History Survey I, I have devised an assignment that weds together the history of art and the hands-on making of an object to make the culture and context memorable and meaningful to students. The assignment allows students to delve into the ancient culture of the Indus River Valley. Archaeologists have found over 3500 stone seals associated with the Indus culture that thrived between 2300 and 1750 BCE. Each seal is incised with a profile image of an animal and one or two lines of Indus script, which unfortunately remains largely untranslated by modern scholars. 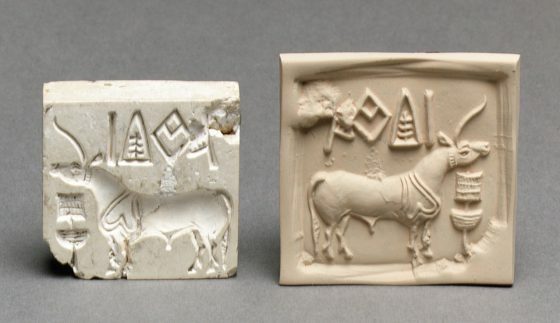 Indus craftsmen carved the seals out of steatite and then fired them to add durability. The seals were pressed into soft clay, and placed on the mouths of jars and perhaps used to create tags for sacks or other containers. Seals and seal impressions have been found in locations throughout the ancient world, as far afield as Mesopotamia, central Asia, and the Arabian peninsula, suggesting that Indus Valley merchants were involved in extensive, long-distance trade. I shared the following video with my class so that students could understand the physical nature of the seals, and how they functioned as stamps. The seals, then, it seems, were used as a way to identify individuals, as marks of status and identity, and perhaps even as a very early form of branding. In studying the seals, and preparing to teach the material to my classes, I became fascinated by the idea of the origins of using words and images as a form of individual branding and identity creation. From my ponderings, I devised an activity that would allow students to consider these objects and their meaning in the context of their own lives and identities. When it came time to discuss the Indus seals with my students, I posed the question to my class, “If you had to choose just one or two words, and one image, to identify yourself, what would you choose?” To follow up, I distributed small square sheets of paper, 4 x 4 inches in size, and pencils, and asked my class to sketch an image of an animal and write one or two words that they felt might serve as an appropriate identifier for themselves, in emulation of the Indus seals we had studied. In order to relax the atmosphere and make the activity fun, I suggested they start to generate ideas by using their phones to take online quizzes to determine what their spirit animal might be. After the surprising discoveries of spirit animals (mine was a goat…) and giggles subsided, students began to really work out what images and phrases they might use as identifiers. I stressed that the exercise was not to be about creating skilled drawings, but about conceiving of identity through simple visual means. For my larger survey classes, with enrollment generally at 30 students, this is where the exercise ended. And, students found it valuable and memorable. For a smaller section of 15, however, we took the project further. 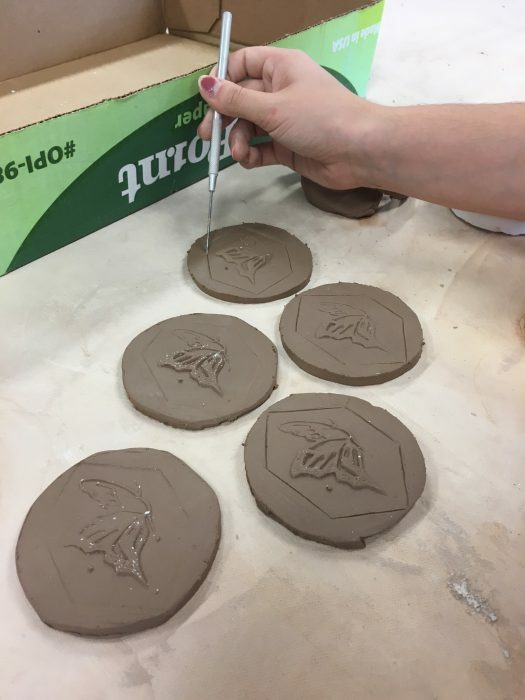 Thanks to the generosity and ideas of a colleague in the sculpture department, these students had the opportunity to transform their sketched seals into three-dimensional representations. 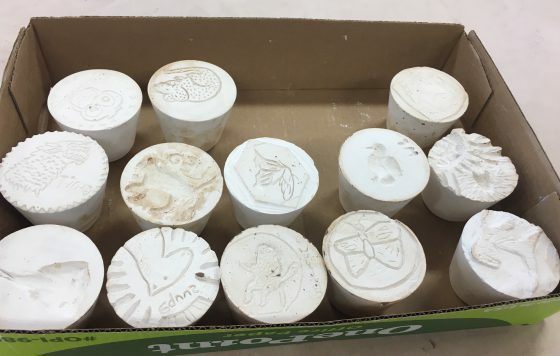 Each student was given a plaster mold of a cup with a flat surface, on top of which they carved their designs with metal tools. 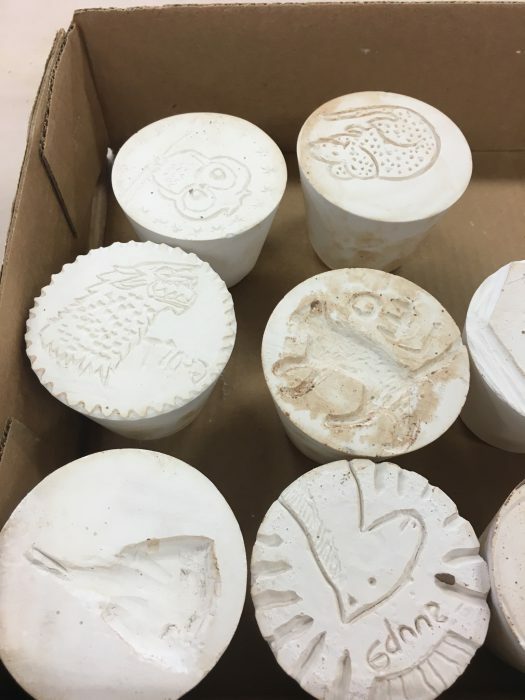 As they carved their designs, my colleague and I reminded them that these would be used as stamps to be pressed into clay, so their images would “print” in reverse. Thanks very much to the expertise of our sculpture professor, the students successfully navigated the carving process. The plaster set and dried over the next day. 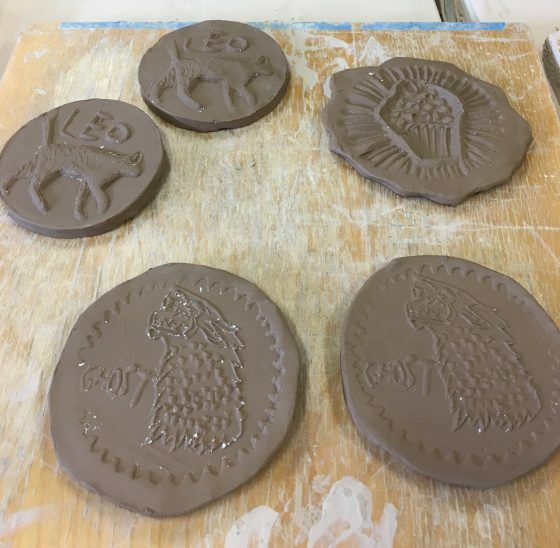 During the next class meeting, the students pressed their plaster seals into clay to create impressions of their visual branding, just as those using the Indus seals would have in 2000 BCE. As a final exercise, I asked students to spend ten minutes writing a reflection about the experience, whether they found it interesting, or challenging. Most commented about the usefulness of a hands-on experience to understand more concretely the physical process that must have been involved in making these objects. As usual, your teaching methods transcend the typical presentation of material for students to simply absorb and enter the realm of self-discovery and identification with the creative processes of other times and other people. Oh to be a student in your class!